They don’t work outside their house. They don’t give spiritual blessings. They don’t recognize a history where women actually did the latter. For Brooks, they don’t approve of the failure of the Church of Jesus Christ of Latter-day Saints to support the national Equal Rights Amendment in 1982. And perhaps most importantly, they generally don’t follow ALL the rules. For Young Mormon Feminists founder Hannah Wheelwright, it was a “star-studded night,” when Brooks encouraged individuals to write what they don’t think good girls – especially good Mormon girls – do. She and friend Victoria Birkbeck guest spoke alongside Brooks. That includes times when young men at BYU question her pursuing a major (political science) that causes her to “have opinions,” she said. Wheelwright’s story – one of the five-minute audience stories with Birkbeck – focused on that account one of her first days on the Provo campus after arriving as a freshman from Washington, D.C. The event is one in a series titled The Porch, created in 2011 by BYU English student Derrick Clements, from Stockton, Calif. He was “excited” about the event for two reasons: Birbeck’s conception of the theme (he doesn’t like coming up with them) and Brooks’ visit. (She first agreed to come to Utah’s Wasatch Front to speak at a religion symposium at Utah Valley University, a neighbor within a few miles of BYU.) Brooks wrote “The Book of Mormon Girl” to chronicle her relationship with the church as a social liberal. “At the center of every good story is an interesting conflict. I think that’s maybe why it’s easier to find more progressive points out of The Porch,” Clements said. “I try to avoid straight-up activism and political messages. That’s why Brooks’ “The Book of Mormon Girl” is so “personal,” according to comedian Jon Stewart. That’s indeed the foundation for Brooks’ own narrative, she says, rather than to be a “self-promoter,” as a Deseret News editor once told Aggie BluePrint. But she acknowledged her peculiarity. 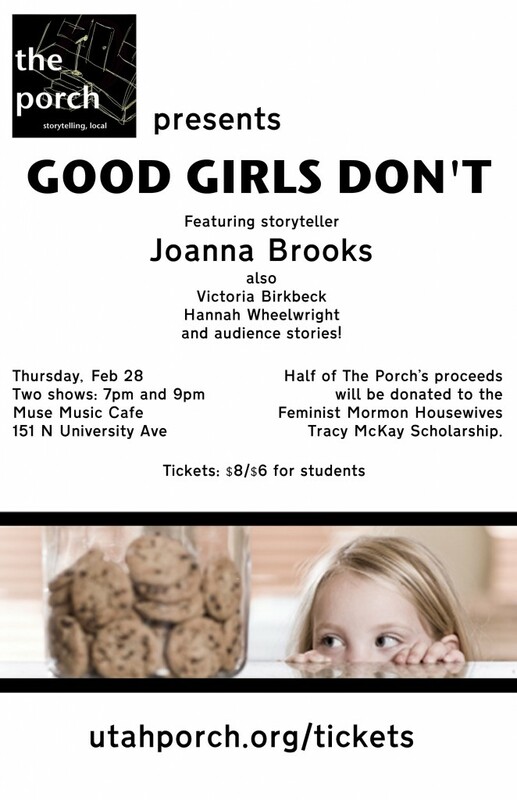 Invitation to “Good Girls Don’t” event with Mormon writer Joanna Brooks this past spring. Brooks led fans in celebrating Mormon feminism. Previous Previous post: The tweet life of Chari Hawkins: about as lively as her goings on the track. That’s really lively for the All-American.